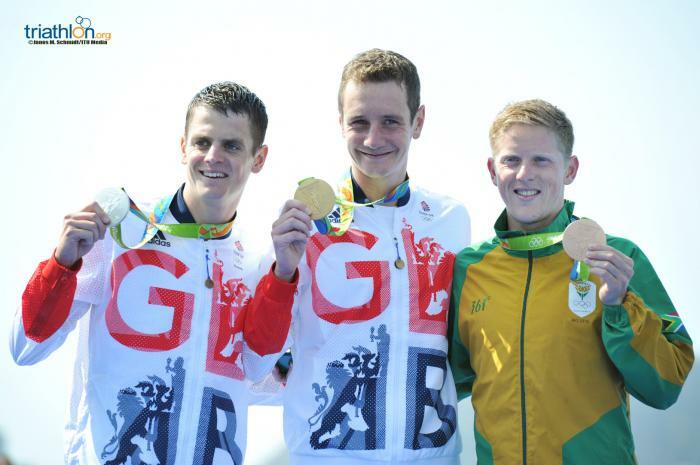 Rio, Brazil – Great Britain’s Alistair Brownlee has become first triathlete to successfully defend his Olympic title, with a crushing performance across all three legs leading him to Gold in the Olympic triathlon event in Rio on Thursday. 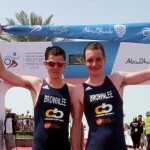 Sweetening the pot, Alistair shared the podium with younger brother Jonathan Brownlee, who crossed over next for silver. Surprising even himself, Henri Schoeman (RSA) scooped up the final medal in bronze position. 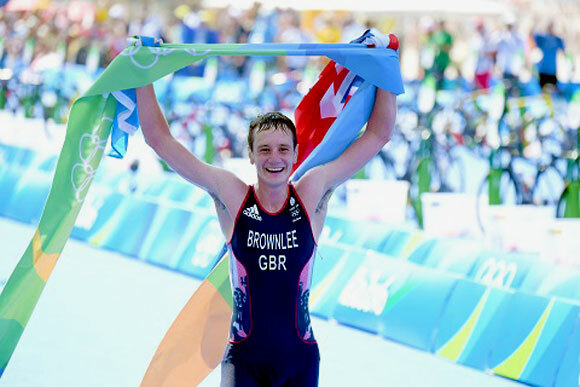 Back to his best form at Copacabana beach, Brownlee was in the lead from almost the very start to the very end – pulling away from younger brother Jonathan Brownlee before the halfway mark of the run, to eventually win in a time of 1 hour 45 minutes and 1 second. His result means he claims a rare place in triathlon history, not only as the first athlete to win two Gold medals in the triathlon event, but the first to do so at successive Olympic Games. 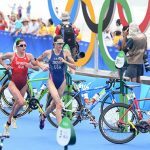 Jonathan Brownlee claimed the silver to make it a banner day for British triathlon and the Brownlee family, adding to his bronze medal in London. 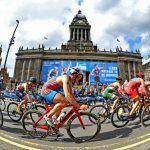 Behind the Brownlees, it was South Africa’s Henri Schoeman who was having the race of his life to claim South Africa’s – and Africa’s – very first medal in triathlon. 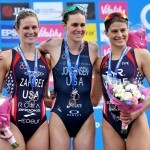 It was the first major podium place in Schoeman’s career, having not made a podium in the World Triathlon Series. Just behind him was teammate Richard Murray (RSA), recording the fastest run split of the day to finish fourth. It was the first time ever that South Africa had placed two men in the top 10 of an Olympic event. As expected, the Brownlees then ratcheted up the speed on the first bike lap, in the process narrowing the lead group to 10, Jonathan Brownlee (GBR), Alistair Brownlee (GBR), Henri Schoeman (RSA), Aaron Royle (AUS),Martin van Riel (BEL), Vincent Luis (FRA), Andrea Salvisberg (SUI), Ben Kanute (USA), Richard Varga (SVK) and Alessandro Fabian (ITA). The lead group’s strategy in the first lap was clear, start to burn away the rest of the field. With most of the group rotating turns at the start, they rocketed up Rio’s tough hill. And that approach paid dividends immediately. But they hadn’t even finished the first lap before the Brownlees made their killer move. Just ahead of entering transition to start the second run lap, they flew off the front, and Luis simply couldn’t go with them. Behind him, Schoeman was catching and shortly overtook the Frenchman. The South African settled into third spot early on in the run and didn’t let up, leading to a historic medal. His teammate Murray was flying behind, along with Portugal’s Joao Pereira – who finished fifth.